Hunting dogs aren’t couch potatoes — they’re four-legged athletes that need to train all year to be able to perform at their best. Many of today’s most popular breeds of gundogs are prone to arthritis and hip problems as they age. Regular year-round exercise can help limit some of the problems. “Dogs are like people. When we get overweight, our joints ache and we don’t get around as well. When a dog that is supposed to weigh 60 or 70 pounds weighs 100, he’s not going to get around in the field very well. Overweight dogs won’t hunt as well as dogs that are fit and trim,” Miller states. To prevent his dogs from getting overweight, Miller provides them with plenty of exercise and doesn’t feed them more than they need. A dog that sits in the house most of the day doesn’t need to have his food bowl full all the time. Ask your vet for advice. “Lots of people feed their dogs treats and table scraps in addition to their dog food, which is why they are overweight,” Miller says. Throughout the year, Miller runs his dogs nearly every day, but when July rolls around, he picks up the pace and concentrates his efforts on getting his dogs in the field and in the water almost daily. “Cattails, weeds and grasses is a marsh or lake can be difficult barriers for dogs. After a few months of not being in that environment, a dog gets soft,” Miller says. “Dogs that aren’t trained in the tall grasses and cattails before the season often have bloody paws and sores around their eyes and inner thighs after a hard day of hunting. Training them on a regular basis in this type of environment helps toughen their skin, eyes and paws for the hunting season. They then will work hard all day for me. If I didn’t train them all summer in the grass and marshes when the season arrived, they would be worn out after a few hours of hunting. “It’s like an athlete — if he sits down and bench presses 50 times when he hasn’t done it in a while, he’ll probably be sore. To eliminate being sore, he must lift weights regularly,” Miller adds. Miller regularly observes hunters who, two weeks before the hunting season opens, realize they haven’t trained their dog and then decide to put it through hours of training in just a few days. “People think they need to train their dogs for hours to get them ready for hunting. The truth is, 20 or 30 minutes of training daily for a few months is better than three hours a day for a couple weeks. A dog thinks 20 minutes of training is fun, but three hours of training is boring, and he often stops performing if you push him for hours,” Miller explains. According to Miller, keeping a dog interested in a training session is the key to a happy, fit dog that’s ready to hunt. “I will train my dogs in fields one day and in a pond the next. Or, I’ll work them hard in a field and let them play around in a pond. I constantly switch things up to keep things fresh and new for the dog,” Miller says. “They learn much quicker and have more fun this way. A dog won’t learn as much or work as hard for his trainer if he trains in the same place every day. Hunters should have multiple places to train their dog so the dog will have fun and not always know what’s next. If he always trains in the same place, a dog will know what to expect and half-heartedly go through his regular routine." 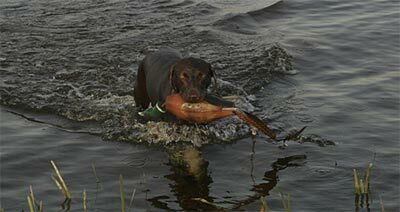 After several weeks of field and water training, Miller introduces his dogs to both live birds and dead birds. “Seeing, touching and smelling a live duck or pheasant doesn’t help a dog get ready for the season physically, but will help him mentally. Many dogs that are cooped up too much don’t actually see or smell a live bird until they are hunting. Then they go crazy when they see or smell a bird and are difficult to control. 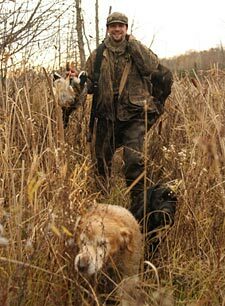 If a dog is introduced to birds several weeks before the season, he is used to seeing birds and will work harder for his master because he knows what is expected of him instead of running off into a field or pond and not coming back,” Miller say. Miller also suggests dog owners feed their dogs after a training session instead of before it. “What happens to a person after they eat Thanksgiving dinner?,” he asks. “They go take a nap. The same is true of dogs. When they are done eating, they want to go to the bathroom and lie down. Feeding my dogs after I train them encourages them to work harder during the training session. Food is their reward.”If you plan to hunt with a dog all day, Miller suggests giving the dog a snack and a break about midday. “I don’t feed him a meal at that point; just a snack. It gives him an extra boost and helps him retain muscle memory,” he adds. For many of us, finding time to spend even 20 minutes a day with our hunting dog can be challenging. If you don’t have time to keep your dog fit, most professional gundog trainers have training programs available to get rusty dogs ready for the marsh. “I have a lot of customers throughout the Detroit area and much of Michigan who drop off their dog for a few weeks or a month before hunting season. They have me work them in fields and in water and introduce them to live birds. A good dog trainer can’t work miracles, but he can get a dog in shape so he won’t be sore on opening day or end up in trouble because he was too far out of shape,” Miller states. Keeping a dog fit and trim can be a daunting task, but small amounts of daily training during the summer is all it takes to get the extra weight off a dog and get him ready for the hunting season. Training 20 minutes a day and watching his food intake will keep the doctor away. Most of us who hunt waterfowl or upland game all day bring a few snacks and drinks along for ourselves. According to Tim Fisher, president of Retrieve Health, a company that makes health products for hunting dogs, we should do the same for our canine companions. “Every time a hunter stops to fuel up by drinking a bottle of water, he should give his dog something to drink as well,” Fisher says, noting that hunters often overlook the hydration needs of their dogs when hunting. “A lack of hydration in a dog leads to frothy blood. Frothy blood can’t work as efficiently at getting to all the muscles throughout the dog’s body. Lack of blood to the muscles causes muscle atrophy, which leads to muscle and hip problems. 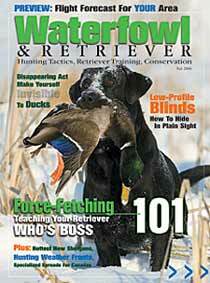 The problem can easily be fixed by keeping dogs hydrated,” Fisher adds. Retrieve Health offers Retrieve Hydration, a powder that, when added to regular water and consumed by a dog, actually brings oxygen to the blood and muscles faster than water alone. The Retrieve Hydration Drink contains electrolytes, amino acids and oxygen enhancers. Giving a dog an old-fashioned doggy treat might stop his hunger, but there are many products available that cure hunger and help muscles and joints. Retrieve makes a dog snack called Tri Energy Bars that give dogs vitamins, minerals and glucosamine, all of which give dogs a boost to help them hunt all day and help maintain healthy muscles and joints—- something dogs need to keep them going all season long. Being aware of a dog’s health needs and providing them with the proper nutrition helps them hunt harder longer and stay healthier, resulting in more seasons in the field for Fido.